Katonah Village, New York is up in arms over the declaration that their star resident, Martha Stewart, intends to trademark the town's name for a line of products. The Katonah Village Improvement Society has pledged $200 to a legal fund for the purpose of fighting the domestic goddess in court if necessary. They worry that if the town's name is trademarked, they won't be able to use it on their own goods and services. The town has put $200 towards fighting Martha Stewart in court? A town where the average home price for 2006 was $912,000 is only willing to pony up $200 to keep the woman who figured out how to make baked apples in prison using nothing but a paper bag from owning their town? Putting $200 towards a legal defense fund to fight Martha Stewart is like putting butter on a 3rd degree burn, yes you are being proactive, but you are probably doing more harm than good. A woman who can double her empire from prison isn't the kind of woman you mess with. Katonah should give up. Embrace their new overlord. Maybe send her a nice pie with a monogrammed phyllo crust or perhaps compile a book of pictures of local birds. Just something that says "We didn't mean to oppose you. Please don't buy all of our homes and children out from under us." Imagine a Martha Stewart-Google merger. That company would truly rule the world (while making it more beautiful!). 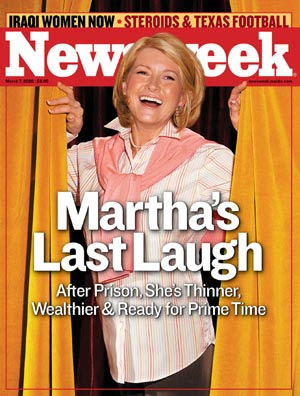 Martha planted the law suit in order to get more press for her "brand". The town really could care less, hence their $200 in contributions. That's like what some high school kid up there would spend on her cheap sunglasses. Maybe they think the case will only take 30 minutes of legal work to sign over the town name to Darth Stewart. I love it when celebrities try to trademark things that by any reasonable standard should be considered Public Domain. That's hot.